Live at the Merdeka Hall, Putra World Trade Centre, Kuala Lumpur, Malaysia, September 7, 2002. This Friday is Merdeka Day, Malaysia's National Day (Aug 31) and what better way to remember this than a gutsy fan's access to a soundboard recording of the Indian jazz fusion/world music band, Shraddha. 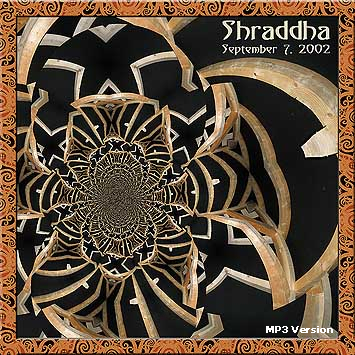 What's significant is that Shraddha is composed of members of the infamous jazz fusion band, Shakti. This gig also marks one of the very first performances of Shraddha as a working unit. In the '70s, Shakti was a group that fans remember because it had John McLaughlin and they played a fusion of jazz and Indian music. World music or world fusion was not coined then but the music was in vogue and the 1975 album, Shakti With John McLaughlin was critically acclaimed. While the members had dispersed over the years, in 1999 McLaughlin got together with founding member, tabla player Zakir Hussain, and formed Remember Shakti. The new group also featured mandolin player U. Shrinivas and eventually vocalist Shankar Mahadevan. 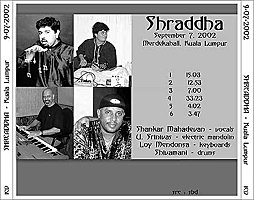 In 2002, Shrinivas and Mahadevan performed a show at the Merdeka Hall, Putra World Trade Centre in Kuala Lumpur. 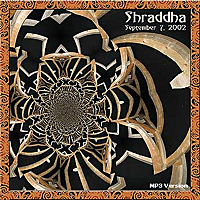 The group, which included drummer Shivamani and keyboardist Loy Mendonsa, now called itself Shraddha. By the way, in the Malay language of Malaysia, 'Merdeka', a word borrowed from Sanskrit, means 'free' or 'independent'. 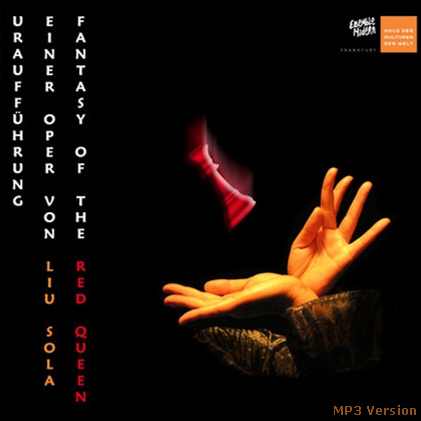 Thanks to Guitars for sharing these lossless soundboard tracks on the internet. These tracks are currently not available for download. Kindly email us at mybigo@bigozine.com if you want to download these tracks at a later time.